“It is possible,” insisted a Netizen from the online community SLR Club with the username Lv.7 Bug, who claimed he could set up a tent which holds 24 people. Everybody else scoffed at his idea which they thought was impossible. As the daring Netizen did not give in, more skeptics joined the argument and a rather warlike stage was set for him to prove himself. Therefore, on September 8, 2012, Lv.7 Bug proved offline that he could actually set up a tent accommodating 24 people in front of hundreds of people. This event, later dubbed as the “T24 Social Festival,” marked the birth of a new kind of public entertainment, “Social Festival.” Social festivals are events born and grown on a Social Network Service(SNS), providing a ground for every individual’s creative fantasy to be actualized with the contribution and participation of others. A Social Festival is similar to a normal festival in that many people flock to participate in a specific program designed for entertainment. However, there are some crucial factors that differentiate itself from conventional festivals. Unlike the typical planning process of a festival, Social Festivals are organized entirely on the Internet, through a two-way communication between the creator and the participants. Therefore, all the work needed for the festival to present itself, from providing the idea to collecting the required equipment, are voluntarily done by individuals online. “Taking part in Social Festivals is a novel kind of entertainment compared to attending officially organized programs like music festivals sponsored by companies. Getting the chance to plan an event is rather like casually enjoying time with friends than spending money for a planned program,” said Jeon Min-gi, a Freshman in the Major in Journalism and Mass Communication. Furthermore, what differentiates Social Festivals is the fact that they are created purely for recreational purposes, not profit. Thus, the events often stem from ideas or opinions of anonymous individuals online. In order for festivals to actually make people happy, it is crucial that their sole purpose is to provide enjoyment. Social Festivals meet the criteria well because the organizers prioritize fun to profit, unlike giant companies that pursue profit when holding festivals,” said Min Sin-hong, the Leader of Korea Social Festival Association. Taking this into consideration, Social Festivals allow participants to genuinely appreciate the events. On SNS, youths show less reservations in many situations: From making friends with people they have not even met in real life to expressing their thoughts and opinions on various issues. This propels their creativity as seen in cases where inventive User Created Contents get popular. Social Festivals bring to life these creative ideas which may seem “outrageous” in reality. “I like going to Social Festivals because their themes are always somehow goofy and unconventional. What people do in such festivals is something that they would never actually do in everyday life so I feel as though everyone in the crowd are my best friends with whom I can have fun with,” said Lee Hyun-su, a Freshman the Department of Political Science in University of South California. As a matter of fact, almost all of the themes of recent Social Festivals such as “Battle of the Singles” during Christmas started from an individual Netizen’s random idea of letting the all the singles of Korea meet their mates. An unorthodox idea arouses people’s interest, which eventually accumulates to a socially significant level. Even celebrities take interest and participate in those offbeat suggestions, shown in cases such as Suzy, a member of a singing girl group called “Miss A” participating in Water Gun Festival and singer Lexy in T24. “In social festivals, the impression that everyone, including the celebrities, is crazy at the same time makes them normal. 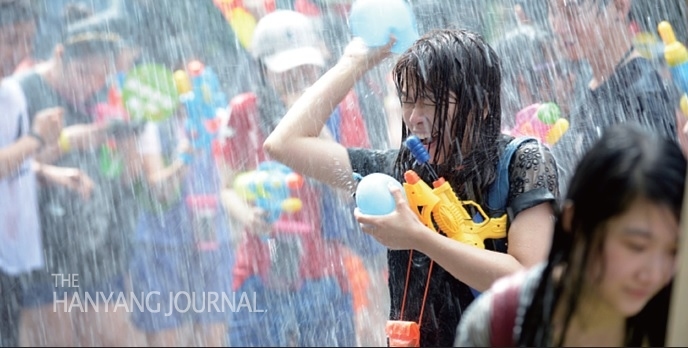 I would not expect to get shot by a water gun unless I am also holding one,” said Han Su-young, a Sophomore in the Department of English Language and Literature at Ewha Women’s University. In this way, Social Festivals have provided the twenties with a large and shameless stage to express themselves and actualize their fantasies. Social Festivals set a desirable model for SNS activity of the youths of the society. Taking part in Social Festivals, they can foster creativity, organizational skills, new relationships and, on top of that, enjoy themselves. It can be a productive way of truly developing oneself through SNS, instead of simply using it to kill time or chat to friends. In this sense, SNS Social Festivals will grow as a virtual public sphere where rich sources of genuine entertainment continuously pop out.